The nervous system is classified into the central and peripheral nervous system. The central nervous system (CNS) consists of the brain and spinal cord, leaving everything else in the peripheral nervous system (PNS). 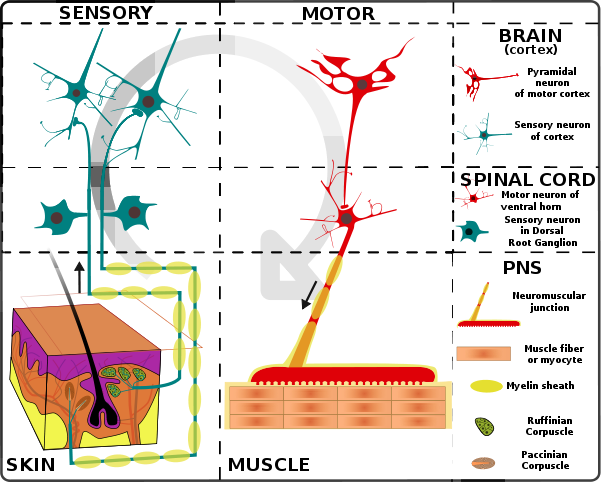 In this article, we will discuss the peripheral nervous system, its divisions and its functions. The peripheral nervous system is itself classified into two systems: the somatic nervous system and the autonomic nervous system. Each system contains afferent and efferent components. The afferent arm consists of sensory (or afferent) neurons running from receptors for stimuli to the CNS. Afferent nerves detect the external environment via receptors for external stimuli such as sight, hearing, pressure, temperature etc. Afferent nerves exist in both the somatic and autonomic nervous systems as both can use sensory signals to alter their activity. The efferent arm consists of motor (or efferent) neurons running from the CNS to the effector organ. Effector organs can either be muscles or glands. The efferent nerves of the somatic nervous system of the PNS is responsible for voluntary, conscious control of skeletal muscles (effector organ) using motor (efferent) nerves. The efferent nerves of the autonomic (visceral) nervous system control the visceral functions of the body. These visceral functions include the regulation of heart rate, digestion, salivation, urination, digestion and many more. The efferent arm of this system can be further subdivided into parasympathetic motor or sympathetic motor. The enteric nervous system is sometimes classified as a separate component of the autonomic nervous system and is sometimes even considered a third independent branch of the PNS. The SNS and PNS are sub-divisions of the autonomic nervous system. The SNS is responsible for the fight or flight responses of the body and originates from thoracolumbar segments of the spinal cord. It uses short preganglionic neurones and long post ganglionic neurones. The preganglionic neurones use acetylcholine as a neurotransmitter while the postganglionic neurones use noradrenaline. The exception this this rule is the innervation of the sweat glands and chromaffin cells of the adrenal medulla, which are cholinergic as they use acetylcholine as a neurotransmitter. These actions are most apparent when the body is faced with stressful situations. It is designed to mobilise energy stores, allowing us to cope with the stress and increase our chances of survival. The PNS responsible for the rest and digest actions of the body and originates from craniosacral segments of the spinal cord. This system consists of long preganglionic neurones and short post ganglionic neurones. Both preganglion and postganglionic neurones use the neurotransmitter acetylcholine. 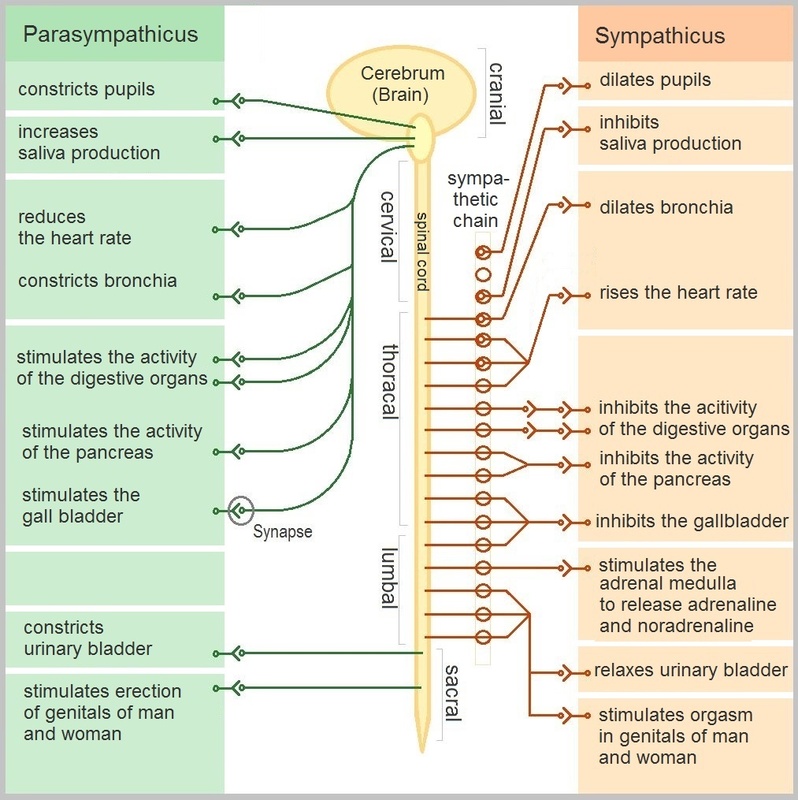 The symathetic and parasympathetic pathways have very similar structures but with a few key differences. The table below shows a comparison of these 2 systems. The PNS also stimulates the enteric nervous system to increase function. Therefore, defecation is still possible during fight or flight mode, while the sympathetic nervous system inhibits enteric function.